George W. Bush has admitted to ordering the National Security Agency to conduct electronic surveillance of U.S. civilians without seeking warrants from the Foreign Intelligence Surveillance Court of Review, duly constituted by Congress in 1978, in violation of Title 50 United States Code, Section 1805. Audio showing Bush's knowledge of the FISA law. 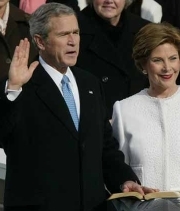 Since Bush shows here that he understands the law, these audio clips combined with his subsequent admissions to breaking this law, reveal that his actions cannot be attributed to ignorance of the law. "You see, what that meant is -- if you got a wire tap by court order -- and, by the way, everything you hear about requires court order, requires there to be permission from a FISA court, for example... And they're an important tool for those who are on the front line of using necessary means, with court order, to find these terrorists before they hurt us." "Now, by the way, any time you hear the United States government talking about wiretap, it requires -- a wiretap requires a court order. Nothing has changed, by the way. When we're talking about chasing down terrorists, we're talking about getting a court order before we do so." Speech by a U.S. citizen presented to a U.S. House Juniciary Committee briefing. This citizen, along with other Quakers, were spied on in their church and homes. Speech by the ACLU regarding its lawsuit involving the spying programs ordered by Bush. U.S. District Judge Anna Diggs Taylor ruled that the NSA wiretapping program violates the 1st and 4th Amendments to the Constitution. Bush adds signing statement to a congressional bill "re-interpreting" it to allow him to read U.S. citizen's mail without first obtaining a warrant. In light of this evidence, and the other evidence to in this impeachment series, how can one doubt the impeachability of this president?